As prolonged drought dries up waterholes and grass, Zimbabwe’s government is taking an unprecedented step to keep the wildlife in its game reserves alive: It is selling the animals to private owners. 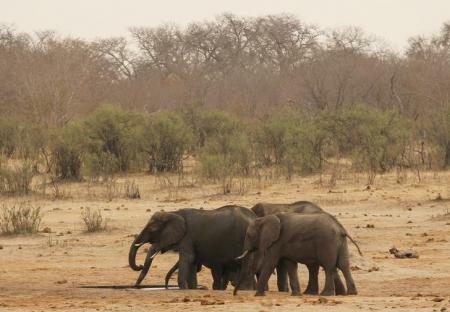 Zimbabwe Parks and Wildlife Authority has invited bids to purchase the animals in its reserves, hoping private game reserves with cash and spare water and fodder may be able to get them through the worst drought the country has seen in three decades. ZimParks, as the conservation authority is known, has not specified what animals might be sold, their cost or whether they could be exported to other countries. But the country’s wildlife includes a range of big tourist draws, including elephants, rhinos and lions. “We have asked individuals and private gamekeepers to step in and buy wild animals in the light of the drought, but the number of animals to be sold would depend on the bids we receive,” ZimParks spokesperson, Caroline Washaya-Moyo, told journalists. Oppah Muchinguri, Zimbabwe’s minister for environment, water and climate, told the Thomson Reuters Foundation that the country aimed to use resources from the sales to support the other animals in its reserves through the drought. “We must mobilise resources for the upkeep of our wild animals, like elephants, by selling,” he said. The Zimbabwe National Statistics Agency estimates that 620 Cape buffalo died in 2015 as a result of the ongoing drought. Such statistics are one of the drivers of the current auction. There are no clear reports about the about the number of wild animals the country has sold so far, but last year Zimbabwe exported to China 100 elephants, out of a population of more than 84,000, according to ZimParks. Each fetched $40,000. In the past, the country has offered a range of animals for sale, including elephants, lions, impala antelope and zebras. To auction animals, ZimParks authorities have invited “expressions of interest” from bidders with the capacity to manage the wildlife. Bidders are required to pay a non-refundable fee of $50. But critics warn the selloff could both hurt the future earning power of the country’s national parks and fuel corruption. “Selling wildlife here has nothing to do with the El Nino-induced drought or any excuse; this is mismanagement, corruption and greed. The government is stealing from the future generation of this country,” charged Johnny Rodrigues, chairman of the animal rights group, Zimbabwe Conservation Task Force. He said the government had warned as early as July 2015 that a strong El Nino phenomenon threatened to dry up pastures and drinking water and impact wildlife. “So why didn’t they store food for wildlife way in advance, knowing that Zimbabwe has droughts periodically?” he asked. In 2014, the government earned about $6 million from game viewing, according to the Ministry of Environment, Water and Climate. Rodrigues said those who will benefit from wildlife sales include Zimbabwe’s government and private game reserves, whose workers are now taking a look at what’s available. Leander Saburi, an independent animal rights activist, said it remains unclear whether animals sold would remain in Zimbabwe. “Nobody knows whether or not private rangers and farmers purporting to have keen interest in buying the starving wildlife will keep the animals. They could be ivory poachers posing as private game rangers so that they easily gain access to our wildlife,” he warned. ZimParks officials said that was not a risk. “Remember there is paperwork needed for one to buy our wildlife and we don’t just sell to anyone, and therefore there is no room for poachers,” said a senior ZimParks official. In line with the ZimParks requirements, bidders for wild animals must provide information about where they intend to keep acquired animals, giving the name and address of the property, its size and its ownership. Some Zimbabwe private game rangers, such as John Harugwa, have met the requirements. Harugwa recently took a peek through the security fence at Gonarezhou National Park outside Masvingo, in southeast Zimbabwe. On the parched ground inside lay a herd of Cape buffalo, resting near a dried-up dam. “Our country’s failure to look after its wildlife amid the drought may be our turn to make money as we gain dominance in the business of wildlife and start pocketing cash from game viewing. Some of us have the means to keep the animals alive,” he told the Thomson Reuters Foundation. What’s clear, he said, is that “wildlife authorities don’t have enough capacity to carry the country’s wildlife through the drought”. Harugwa’s new private game reserve, called HaruPark in Zimbabwe’s Masvingo Province, covers about 85 hectares of former farmland that he recently converted into a game park for tourists. He is amongst 8,000 drought-affected smallholder farmers here benefitting from the U.N. Central Emergency Fund, which aims to help farmers acquire subsidised feed for their livestock. Harugwa said he had accessed approximately 2,000 tonnes of animal feed at subsidised prices, thanks to the U.N. initiative.